Worship in our early days, summer 2005 at Premier Academy Christian Day School. Grace Community Presbyterian Church had its first worship service on January 2nd, 2005, which was held in a strip mall located on Highway 377 in Watauga, TX. This church actually began in the hearts and minds of a group of people years before as they began meeting in a home in north Ft. Worth. Because of their love for the doctrines of grace and their perseverance and God’s good providence, Grace Community Presbyterian Church now exists. 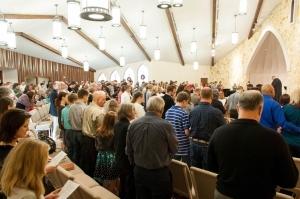 Grace Community Presbyterian Church began as a church plant of Ft. Worth Presbyterian Church. 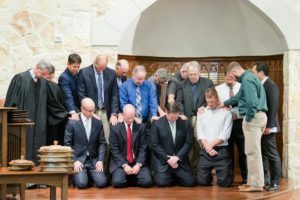 It was the Session and pastoral staff of Ft. Worth Presbyterian Church that provided support, encouragement and oversight of this new church through August of 2006. This relationship was officially recognized at the installation service the evening of February 13th, 2005 at Grace Community Presbyterian Church, which was meeting at Premier Academy, a Christian Day School located in north Ft. Worth. Our first year together, 2005, brought much change. 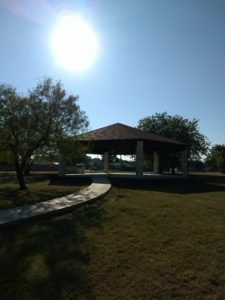 Our attendance doubled, we purchased 6 acres in north Ft. Worth, we raised 80% of the money needed to begin our first phase building project and we hired an architect and moved forward with our plans. In the early part of 2008 our church called Tom Browning as our assistant pastor. After a year of training and the prayerful consideration of the members of Grace Community Presbyterian Church, 3 new ruling elders and four new deacons were ordained and installed in early 2010. 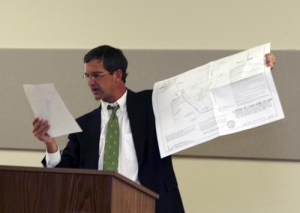 As our body, staff and leadership grew, Grace Community Presbyterian Church also started construction on their new building in August of 2006. 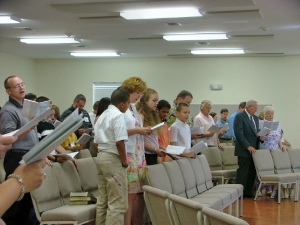 We had our first worship service in our new building on September 30, 2007. By God’s grace and through the generosity of His people, we were able to pay off the note of our building in December of 2009. As this church has continued to experience God’s blessings in amazing ways, she began a building expansion project in the last quarter of 2011. It was completed in December 2012. With this expansion, we were able to double our square footage. 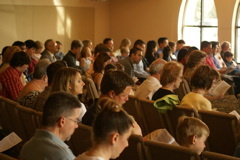 In addition to many new classrooms, we are able to seat about 400 in our chapel. We are committed to not growing beyond what our current and final space can accommodate. It is our conviction that this would be as large as we would want our congregation to grow, so that we can continue to minister faithfully to one another. If we grow in numbers beyond what our new worship space and building can hold, our hope is to plant one or more daughter churches in surrounding areas. In the early part of 2014, we were able to call our second assistant pastor, Davis Morgan. The summer of 2014 we had the opportunity to build a large kitchen. We eat together once a month after our worship service and this kitchen has provided us the space and equipment to host these large lunches. At the same time we were able to provide for our growing families a first rate playground. This was something our many children had been asking for since we occupied our first phase building in 2007. In December of 2015 we paid off all loans regarding our building expansion and new kitchen. Because of the generosity of the people of Grace Community Presbyterian Church, we began 2016 completely debt free. We also completed a pavilion in late 2017, believing it will serve our people well for years to come. In June of 2017 we ordained and installed our newest officers. This is another wonderful provision of our God for this particular church. Read more about our leadership on this page. Our first worship service (phase 2) December 9, 2012. God has blessed us with a facility that is used by our presbytery for women’s retreats, our presbytery meetings and other PCA functions. There is also a homeschool Co-op that meets every Thursday for classes during the school year. We also have a bi-lingual Hispanic church that uses our facilities for their Christian Education and corporate worship services on Sunday afternoons. Throughout our history we have sought and will continue to seek to provide opportunities for pastoral interns to serve alongside us as they are considering vocational ministry. God has blessed us immensely with members who serve, leaders and a facility; all of which bring glory to His name. We realize that the history recounted here is another way of retelling the story He is writing. If you are so inclined, please pray for this church as we seek to be faithful to God in the place where He has placed us.